Pat Orden was fishing near the Kaneohe Marine Corps Air Station on the windward side of Oahu when he hooked his 28.5-lb bluefin trevally. Pat was using an Outcast Magnum pole, Newell 550 reel and 80-lb test Trilene line. 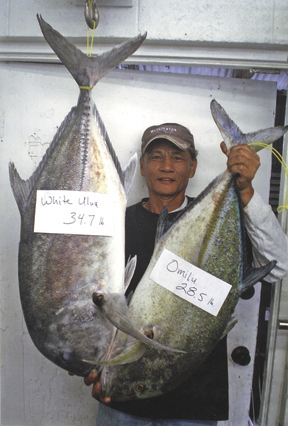 Pat's New Year's Eve catch may be the largest 'omilu in the world.